The public could plainly see what the Lee administration was doing. The Four Rivers Project was an enormous corporate welfare project that transferred tax money to construction companies. 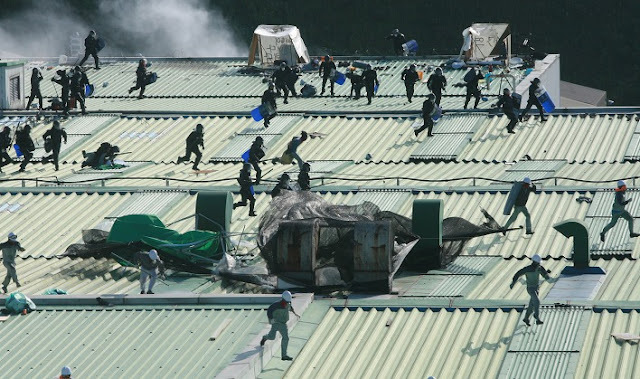 Ssangyong Motors was a killing field in which the management’s violence was above the law while the labor was allowed to be violent only to their own lives. And they . . . did not care. From the latter half of 2009 to late 2010, Lee Myung-bak’s approval rating floated around the respectable range of mid- to high 40s. It probably helped that North Korea attacked twice in 2010, sinking a South Korean navy ship and shelling a northerly island. But even when it became known to public in mid-2010 that the Prime Minister’s office was running a wide-scale surveillance on civilians, most people simply shrugged and moved on. For liberals, the most stinging betrayal was from the Koreans in their 40s and 50s. The generation that bravely fought the dictatorship 20 years ago in their youth was now mostly middle managers and business owners. To protect their retirement portfolio, they cynically looked away as the Korean democracy they built was backsliding. Lee Myung-bak’s support did erode in the third year of his presidency, particularly as the Korean economy began to feel the fallout of the 2008 global financial crisis. The Democratic Party would win drip-drip victories in the elections. In 2010, the liberals took the slight majority in the Local Elections (which elects governors and mayors,) including at the conservative Gyeongsangnam-do. The beginning of the end for Lee Myung-bak administration came in 2011. Defeated in the mainstream arenas of politics such as the National Assembly and television, liberals found new battlegrounds: the local government and the internet. Noted liberal pundit Kim Eo-jun, whose commentary straddled between legitimate criticisms and wild conspiracy theories, began his most successful endeavor in April 2011: a podcast called “I’m a Cheat” [나는 꼼수다]. Ostensibly, each episode—which was anywhere between 30 minutes to three-plus hours—was a dedication to Lee Myung-bak, who was always referred to as “His Excellency.” After discussing the latest discovery of Lee Myung-bak’s corruption, Kim and his co-hosts would throw their catchphrase: “But of course, His Excellency would never do that.” At one point, “I’m a Cheat”—a political podcast whose only market was South Korea—was the most played podcast in the world. The cast of the "I'm a Cheat" Podcast. From left, Ju Jin-u, Kim Eo-jun, Kim Yong-min and Jeong Bong-ju. Meanwhile, local politics provided the political issue that made the first meaningful crack on Lee Myung-bak: free school lunches. The liberal governors, mayors and school district superintendents began free school lunch programs in mid-2000s, which pressured other localities to do the same. Against the anti-welfare conservative administration, the liberals managed to locate the issue of "feeding children," the most sympathetic possible argument in favor of social safety net. By the end of 2011, Korea’s liberals were in a hopeful mood. Lee Myung-bak’s approval rating crashed again to the low 20 percent range. Liberals mocked Lee Myung-bak as “the patron saint of democracy,” as his offensive presence allowed them to win small elections repeatedly. There was only one year left in Lee Myung-bak’s tenure; daybreak seemed near. 2012 was supposed to be an opportune year. South Korea’s presidential term is five years with no re-election allowed, while the legislature’s term is four years—which means the presidential election and the National Assembly election could occur in the same year only once in 20 years. And 2012 was that year: the Assembly election in April, then the presidential election in December. For liberals, the game plan was straightforward. Ride the wave for the legislative victory, take away Lee Myung-bak’s majority in the National Assembly and push into a lame duck status, then take back the presidency. With Lee’s popularity in the gutters, liberal victory seemed assured. New liberal contenders seemed to emerge every day. Ahn Cheol-su, a tech entrepreneur, was enjoying significant popularity as a refreshing outsider. Young people flocked to the United Progressive Party (UPP), supposedly the more liberal alternative to the mainstream Democratic Party with more aggressive demands for social welfare programs and greater hostility to large corporations. With greater leverage, UPP demanded the Democratic Party to not run candidates in certain districts to unify the opposition, which the Democratic Party grudgingly acquiesced. It did not go according to plan. All the polls leading up to the National Assembly election, including the exit polls, were significantly off. The conservatives held onto the majority with 152 out of 300 seats, more than the greatest possible number of seats it was projected to win. Park Geun-hye, the leader of the renamed Saenuri Party, solidified her reputation as “the Queen of Elections.” The Democratic Party gained modestly, but without the plurality, it could not drive the political narrative as it wished. 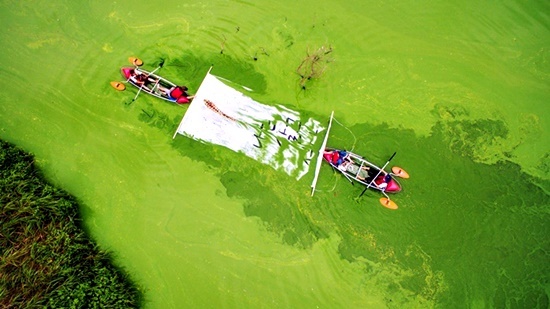 Rather than being the fresh new liberal hope, the UPP was a collection of Jill Stein-like hucksters who could only win elections by eating into the Democratic Party’s seats. The liberals did not win because they failed to inspire. Assuming Lee Myung-bak’s unpopularity would automatically translate into their victory, the various liberal camps were too busy splitting the pot they did not even win yet. Rather than carrying the wave forward, Korea’s liberals had the shenanigans that went into dividing the spoils would blow up in their face. Only a month after the National Assembly election, it was revealed that two of the UPP National Assembly members engaged in a massive voter fraud at the primary stage, allowing some of the party members to vote multiple times. The UPP, a collection of frauds, lacked the ability to self-discipline. The UPP meeting to expel the offending Assembly members (which would have stripped them of the election win) disintegrated into an ugly, physical brawl. When the party was unable to expel the offenders, a number of UPP National Assembly members simply quit the party. This, rather than Lee Myung-bak’s corruption and assault on civil liberties, became the dominant political drama in the fall of 2012. On the conservative side, Park Geun-hye was successfully distancing herself from Lee Myung-bak. It helped that she was already considered to belong to a conservative faction separate from Lee Myung-bak’s, as she had run against Lee in the presidential primary in 2007. To further distinguish herself from Lee Myung-bak, she put forth a narrative of her biography as a dedicated public servant. Unlike Lee who came from the dirty corporate world, Park Geun-hye was an elegant daughter of a former president. (Never mind the fact that the former president was dictator Park Chung-hee—Korea’s conservatives love their dictators.) Her public life was so dedicated to leading the conservative party, to a point that she never even married. Park Geun-hye also showed surprising pragmatism and flexibility as a politician. 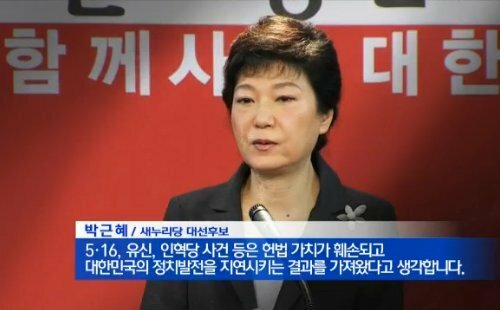 Seizing on the free school lunch issue that dominated the politics news for more than a year, Park Geun-hye called for a dramatically expanded welfare state, which conveniently included big increase for the pension for the elderly who reliably voted for her based on the memories of Park Chung-hee. (Spoiler: she would not keep her promise.) When the liberals tried to attack her for leaning into her dictator father’s legacy, Park Geun-hye issued an apology for her father’s coup d’etat and murders. No equivalent development happened for the liberals. There was no appreciation of biography, no discussion of policies, and not for the lack of materials. Both Moon Jae-in and Ahn Chul-soo had compelling personal history. Moon was a son of North Korean refugees, a former special forces paratrooper who spent his life serving the needy as an attorney before entering politics. Ahn was a doctor-turned-software engineer who developed a path-breaking antivirus program Ahnlab. (Don’t laugh, Korean readers—it really was path-breaking when it first came out, before Ahnlab became more of a government contractor than a software company.) Moon and Ahn also represented a meaningful debate within the liberal camp: should Korea’s liberals try to make their progressive stance clearer (as Moon did,) or should they try to triangulate and move toward the center (as Ahn did)? All of these narratives were subsumed under overriding concern for the liberals: will Moon and Ahn consolidate their candidacy to avoid splitting the votes? Instead of running an inspiring campaign, the camps for Moon Jae-in and Ahn Chul-soo engaged in an ugly horse trade. In early November—a month and a half before the election—the two candidates agreed in principle to unify their candidacies. Then they spent nearly three weeks trying to come up with the rules on how to select the unified candidate. With each candidate obviously preferring the method that would lead to their candidacy, the negotiations broke down multiple times. Finally, on November 23, with less than a month left until the election, Ahn Chul-soo rage-quit his candidacy. Although Ahn said he endorsed Moon, he did not do much to help Moon’s campaign. Even after all this, Korea’s liberals still had time. The average of the polls from late November showed Park Geun-hye leading Moon Jae-in by a sliver. Some polls even showed Moon Jae-in leading. Moon Jae-in also outperformed Park Geun-hye in all three of the televised presidential debates. Korea’s election laws prohibit publicizing poll results starting six days before the election. During this “blackout period,” hopeful whispers began that Moon Jae-in’s number has overtaken Park’s. Then came the scandal, potentially game-changing. On the night of December 11, 2012, the police and the Democratic Party official rushed to a Seoul apartment based on an explosive tip: the National Intelligence Service, South Korea’s spy agency, was running a team dedicated to interfering in domestic politics, primarily through having its agents send out fake internet comments, upvotes and tweets. At the apartment, the solo female occupant locked the door and refused to come out. The Democratic Party officials laid siege to the apartment while attempting to secure a search warrant. When the police finally (and reluctantly) entered the apartment, the occupant was revealed to be an NIS agent Kim Ha-yeong. can be heard claiming that she was not an NIS agent. The six days from December 13 to December 19—the date NIS interference was confirmed, and the day of the election—featured one of the most shameless and ludicrous spectacles in Korea’s democratic history. (And that’s saying something.) For its part, the police and the NIS did everything it could to obstruct the investigation. The NIS issued a patently false statement that the agent had been conducting a regular, anti-North Korea psy ops. Kim Yong-pan, chief of the Seoul Metropolis Police Agency, called the investigating officer to order against seeing a search warrant. (The investigating officer Kwon Eun-hee initially complied, then defied the order and continued the investigation. For her trouble, she was fired.) It took 40 hours for the police to enter the apartment, giving the NIS agent plenty of time to destroy whatever evidence she could. Eventually, it was time to vote. The conventional wisdom was that the higher turnout favored liberals, as the assumption was that the voters dissatisfied with Lee Myung-bak administration needed to show in droves. At 3 p.m., the turnout was already at 60%. When the polls closed at 6 p.m., the final turnout was a very strong 75.8 percent. The liberals were cheering at the numbers. Relying on the internal polls, the Democratic Party officials truly believed they had won. 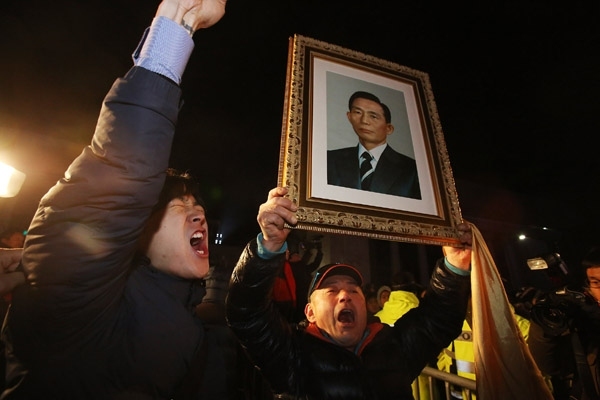 Conservatives celebrate the election victory holding up Park Chung-hee's portrait. Then came the gut punch: all three network TV stations’ exit polls indicated Park Geun-hye was leading by around one percent. The liberals held their breath, hoping for a miracle while noting the exit polls were within the margin of error. No such thing came: Park Geun-hye led wire-to-wire, and all major news outlets called the election by 10 p.m. The final tally: Park Geun-hye 50.1 percent, Moon Jae-in 48.9 percent. Liberals despaired. They got the high turnout they wanted, and they still lost—to the most obvious legacy of South Korea’s dictatorship. True, Park Geun-hye did apologize for her father’s rule during the campaign, but Korea’s conservatives did not mind. They celebrated in the streets, holding up Park Chung-hee’s picture. The darkness continued, with no end in sight. good read.. can't wait for next.. hope there is one coming? Good post, but there is one glaring omission - the role of media. A big reason the liberals were constantly divided and bickering with each other was because the overwhelmingly negative media conditions (being largely dominated by conservative media + the few existing progressive media didn't provide much help with their utter lack of strategy and forward thinking) deprived them of any good rally points. (You did mention 'I'm a Cheat', but their influence can hardly hold a candle to the major conservative newpapers.) No matter what good point you make, without the help of media, it doesn't fly very far, even in the age of SNS. (Despite Korea's reputation as the most wired country, there's a wide generation gap where the older generation is a lot less internet savvy even than other developed countries and these people still rely heavily on traditional media outlets.) And if the media constantly amplifies your every petty flaw and turns away from every merit you have, there's not much you can do. If you ever played Go, you'll understand the agony of being behind. In go, it's pretty much always the losing player who spends more time, because he's desperately seeking the overturning move that doesn't seem to exist. He has to consider all sorts of options because each one of them don't seem good enough. In contrast, the winning player has a much easier time: he considers the first option that springs to mind, and if that seems to be good enough to maintain his lead (which is often the case), they stick with it. You can't apprehend Korean politics without understanding the 'corporate-conservative politicians-media' alliance. Even in the age of SNS, traditional news outlets still remains the dominant source of shared news and opinions, and the chance of some random guy's whistle-blowing gaining traction on Facebook is pretty slim due to the fact that there's just so many random sensational posts generated each day. If the media doesn't do their job right, the truth is unlikely to see light, corruption will reign and democracy will die. TK mentioned in Part 2 in this series that "people segregated themselves into numerous virtual echo chambers and began developing their own versions of reality". This phenomenon would not have been so prevalent if the media was seen as trustworthy. People are falling for all sorts of conspiracy theories because they feel they have no reputable source of truth to rally around. This is a worrying trend indeed, because subjectivism is the very essence of fascism. Historical fascism rose in countries where progressive discourse was systematically suppressed. Because of this, most people weren't given a chance to understand the real reason why their lives were worsening, so they poured their anger not into fixing the real problems but upon false (and easy) targets. I see similar trends rising around the world now, especially Korea (arguably we're getting better, but I still see a lot of worrying trends intensifying such as misogyny and xenophobia), USA, Japan, UK, Spain, etc... all of which are considered among the more conservative societies in the developed world. Sorry for the long rant, but I just had so much to say about this issue. Thanks TK for taking up this important subject and keep up the good work! I simply can't stop my tears as I read to the point "And they . . . did not care." What SK happened in 2009 is so similar to today's USA (and almost, Canada, where I live) as well in Hongkong (where I originally came from). It is sad, and I am looking forward to your next episode. Wish the world will be like what happen in South Korea, in the end.